As you know, we are having new Mohawk Laminate Flooring installed. Today, I want to talk to you about the installation process. First, I want to say that I am soooo happy that we did not chose to DIY our floors. I never could have imagined how much work goes into removing and installing flooring. As I discussed in my first post, we were living with 5 different types of flooring on the first floor of our home. I also discussed why we chose laminate flooring for our home. Now, let’s take a look at some of the things that happen during flooring installation. As you can see in the photo above, there is a ton of furniture moving involved. My husband and I moved some of the smaller pieces like end tables and all of my books and decor to our garage. Living in a small home, there wasn’t a ton of space to move the bigger items. So, the installers simply moved the larger things from room to room while they worked. Thank goodness I didn’t have to move them myself. 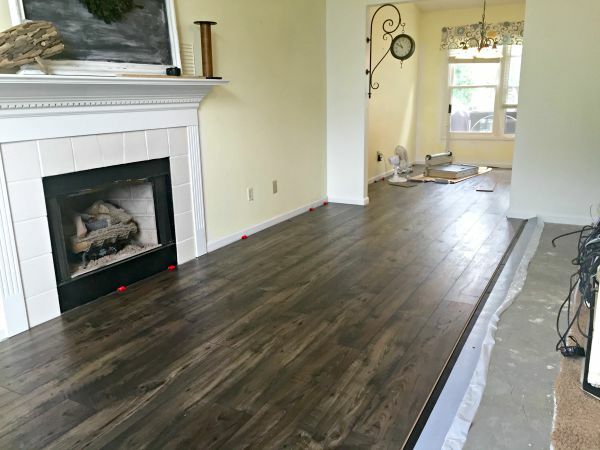 Not only are they heavy, but the installers from Oser Paint and Flooring knew exactly how to move the bigger pieces without damaging them or the floor. If you go back to my first post, you will see the damaged wood flooringthat was in our dining area and the damaged tile that was in our kitchen. The installers had the flooring removed and out on the first day! 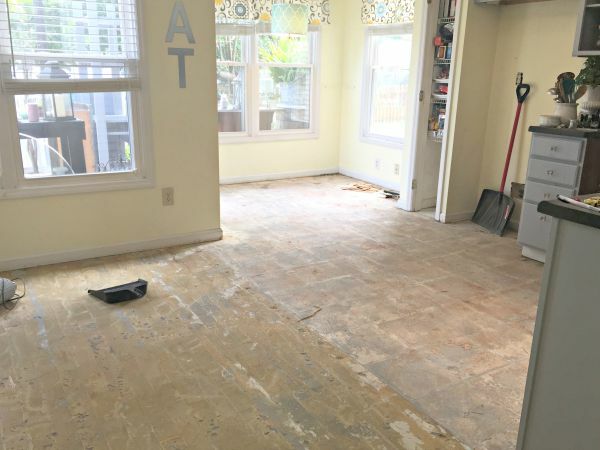 We live in a home that is on a concrete slab, and apparently it is really difficult to remove hardwood floors and tiles because of the adhesive that is used when they are installed. Thank goodness I didn’t have to help do demo on the floors! They had just the right tools to remove them and didn’t damage our walls and cabinets. I also took advantage of not having to be super careful painting, and on the evening of the first day, after the installers had gone home, I painted our breakfast nook! Isn’t the color super fun? 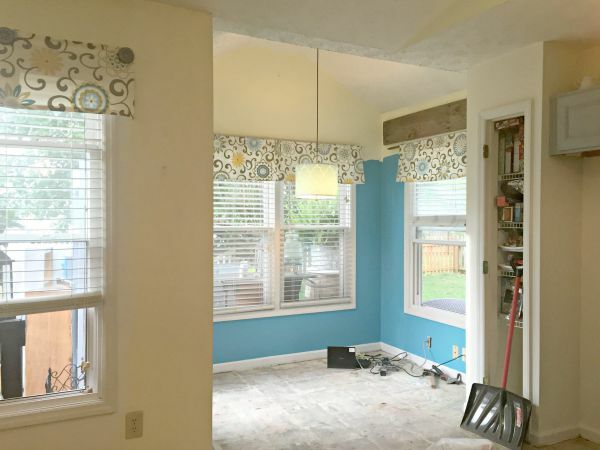 Once the flooring in the dining and kitchen areas were removed, the installers moved the larger pieces of furniture back to the kitchen so they could remove the carpeting and start laying the laminate floors. Don’t they look amazing already??? This is the Mohawk Laminate Rare Vintage Knotted Chestnut. If Knotted Chestnut isn’t your style, there are many more options at Mohawk. I am even more pleased with the way it looks now that some of it is installed, and can’t wait to show you the before and after once it is finished!!! To read this blog post on Jessica’s blog, Mom4Real, visit her site here!